This recipe is my daughter’s favorite & it is very easy to make! If you are making these for your child’s class or a party, I suggest using soy milk instead of almond milk because of nut allergies. In a large bowl mash bananas & mix with oil, brown rice syrup, soy milk & molasses. Add dry ingredients & chocolate chips. 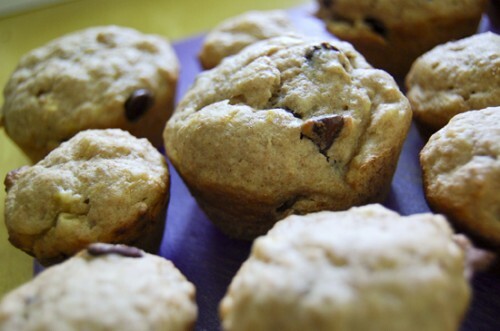 Stir well & scoop into oiled muffin tins. Bake for 15-18 minutes. I know this is kinda off topic from your post but what did you feed your baby? Were they vegans from they were born or no? I heard soy milk can be bad for you,almond milk can cause allergys just like cow milk and that rice milk doesn’t have enough protein/fat for a baby.